Those who knows us a little bit, know we love camping. It gives us a sense of freedom and we love the rhythm you need to follow when camping. You simply can’t rush things. We have camped a bit all over Europe – but so far always in summertime. Last year that changed though. Since we want to do some more challenging camping in the future (yes, Iceland, we are looking at you!) we decided to buy a four seasons tent two years ago. 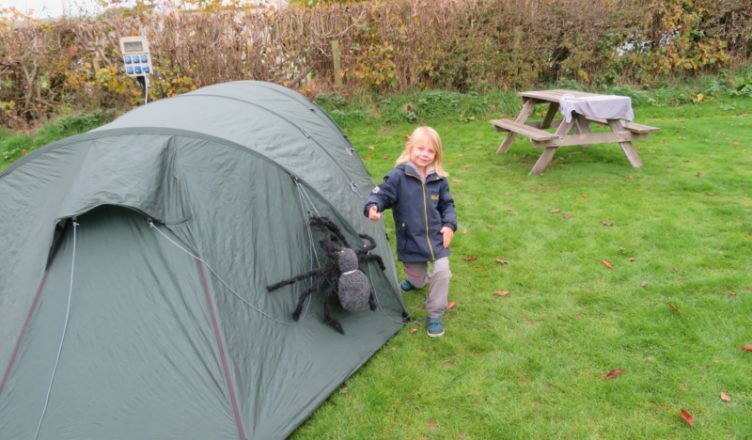 And since we wanted to do a little trip in fall last year (to Wales), we thought… why not go camping? Most people we know thought we were crazy. To be fair, I think most of them probably still think we are. But we did our research and we knew it was possible. 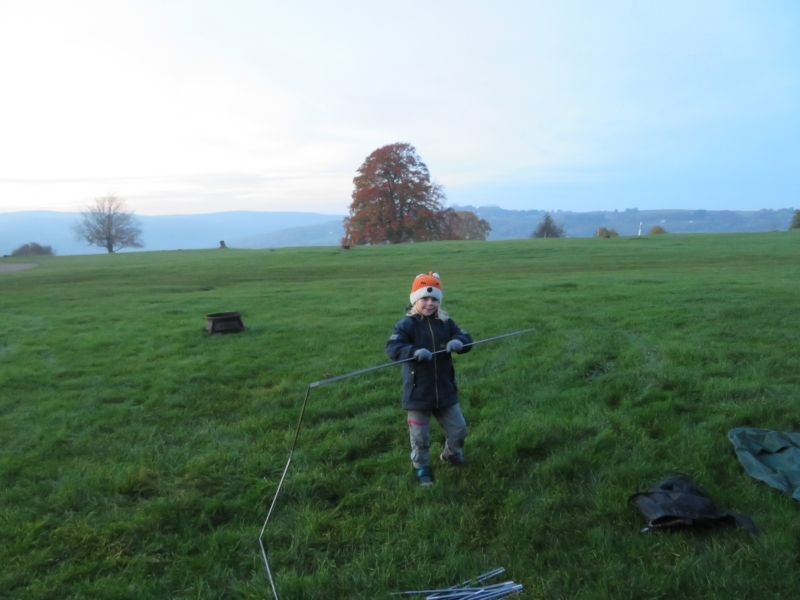 Even with a 6 year old kid… But what exactly do you need for camping in wintertime? From almost the first time we went camping, we went with Fjällräven as brand for our tent. Fjällräven tents are lightweight, easy to set up and can resist a lot of weather types. We’ve camped in pouring rain and thunderstorms with heavy wind, and stayed warm and dry inside. We used to have a two persons tent, but with Febe traveling with us, that one became a bit too small. So we bought a new one, a four persons tent. 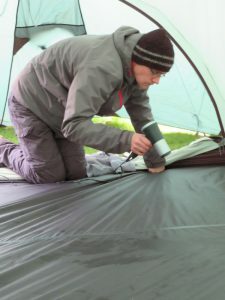 The tent we went for two and a half years ago, the Akka 4, is now already updated to a newer model (the Abisko Endurance 4), but we’ll explain a little bit why we opted for this model. – we have a big front compartment in the tent, to store some bags, boots, cooking equipment, etc… The indoor compartment has mosquito nets (big issue for Annick, since she’s allergic to those bastards…) and is large enough to comfortably sleep with 3, and our dog if needed. If weight isn’t your primary issue (meaning, you’re not planning to go hiking for multiple days in a row) you might want to consider getting a tent for one person extra than your group is. We are a family of 3, thus take a 4 persons tent for that extra comfort. When camping for weeks in a row, that little bit of extra space just makes it more comfy… We also have a second storage compartment at the back, giving us some extra space to store goods close to our head (easy access in the middle of the night). A good tent isn’t enough. There are some basic rules to keep you warm at night. – we use Therm-a-Rest ProLite Mattress Regular sleeping mattresses to camp. For summertime, these are more than comfortable. They have an isolation value (the R-value) of 3.8, which makes them good enough for camping up untill temperatures slightly touch the freezing point. That came in handy when camping out in Northern Finland, where it can freeze in summertime as well. To be on the safe side, we added an extra sleeping mattress underneath it , a simple foam type like this one. , giving us an extra R-value of 2. With an insulation of 5,8, you can camp on the snow in very cold conditions. Always check your isolation values before you leave! – you need a very good sleeping bag. We are very happy with the Blue Kazoo Sleeping Bag from the North Face. Both Febe & Annick have one. With a comfort temperature of -7°C and a limit temperature of -14°C up untill -34°C (in extremes), you keep warm the whole night. The sleeping bag is a mummy shape, which is better for keeping warm, and has a head capuchon you can pull tight to prevent cooling down. After all, you loose the most warmth through your head. You might want to consider a comfy beanie to sleep in as well, for when it cools down even more. – get thermal underwear. You want to get a good set of thermal underwear. Ideally the fabrics used should be a mix of synthetic fabrics with merino wool. This type of wool doesn’t sting, dries up quickly, is really warm and doesn’t smell quickly. Just what you need! You want to work in layers; and avoid cotton at any cost. This fabric dries up way too slow, meaning you’ll get cold quickly. – you will be very happy if you bring a hot-water bottle . Fill it up about 30 minutes before you go to sleep and put it in your sleeping bag. It will heat the bag up, making it feel nice and comfy when you get in. We slept with them inside the bags the whole night, and they stay warm untill morning. Heaven! – try to book in advance. While we hardly ever book a campsite in summertime, we did make reservations for our fall trip. A lot of campsites are nearly empty in that period of year, and the owners are often not around. Also: ask for a spot in the sun. While you want shade in summertime, sun warms up your tent in fall or winter. – take a gas bottle to cook that contains propane (at least a mixture). Don’t use only butane – it freezes! – be sure to take enough lights with you. It depends on what campsite you are staying at. All campsites we stayed at in Wales and England didn’t have lights at night. It gets dark really early, which is not that handy if you want to cook or eat in the evening. Even with a good light, it was often difficult to see enough. – check beforehand if your campsite has a heated shower block. Some campsites do, others don’t have it. For us it was important to be able to shower in the warmth, especially with a 6 year old with us. – change into your pyamas in your tent. The grass will always be wet in the evening, and you don’t want to go to sleep with wet trousers. – for the same reason: have waterproof hiking boots with you on your trip. Dry and warm feet are essential to keep warm. – have enough clothes with you. You don’t want to pack too light. Getting clothes to dry is often hard. You might want to consider buying specialised clothing that dries up quickly. It helps a lot! What issues did we have? 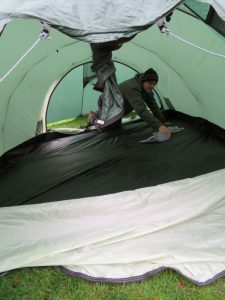 Everything was damp in the morning in our tent: floor, walls, … While we never have issues with moist in the summer, we did have in the winter. We are searching for a solution for this, but we have heared other opinions on the matter stating that it’s something you can’t avoid in fall / winter. We used a hairdryer to dry out our tent from the inside, allowing the place to be dry when we fell asleep. Currently we are thinking of buying an extra (aluminum) isolation mat for underneath the ground floor of the tent. Also a thick waterproof plastic underneath it might help… We’ll have to test it though. The moist was the only thing we had a hard time with. At the end of our camping trip, all that damp had been enough. We got lucky with the rain. 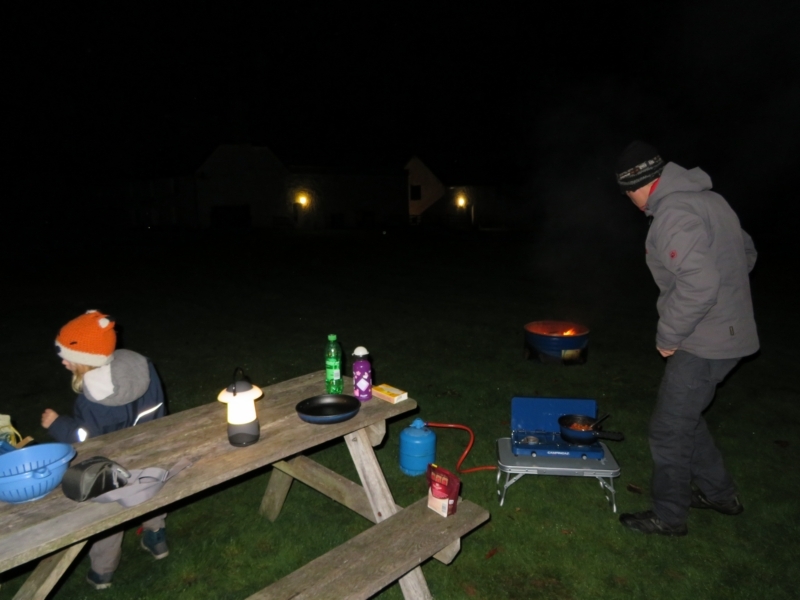 Cooking inside your tent is dangerous (the risk of CO2 poisoning! ), so we’d rather not do that. We still have to buy an extra shelter to cook in when it’s rainy and windy outside. Ofcourse, there is also the option of pub food or a restaurant when the weather gets bad. At least, it was here; we weren’t camping too remote. Yes Iceland, thinking of you again. Yes, I think we will do it again. Though I must admit, it is more comfortable in summertime, I still found it very charming to do. In some campsites we were completely alone, in others we had the company of one or two caravan guests. It was all so very quiet and peacefull. 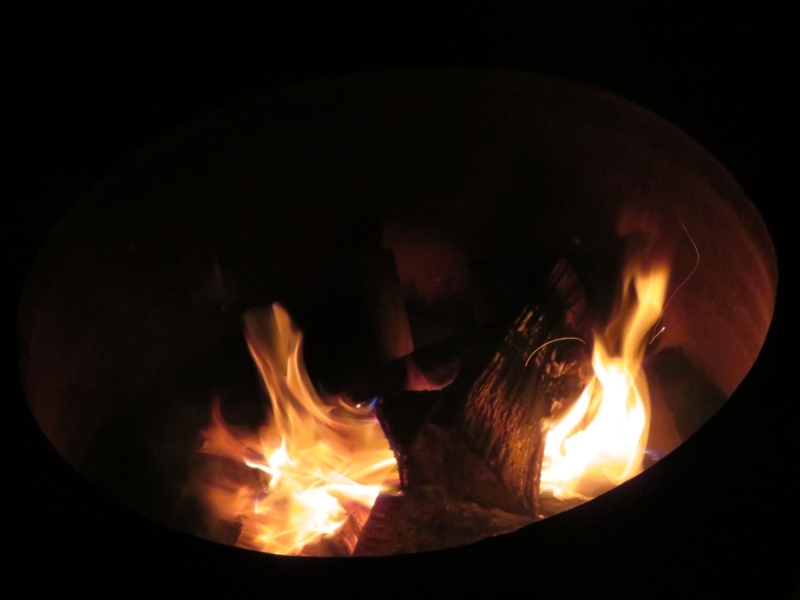 Thousands of stars at night, and a campfire never felt this good.